L-R: Barbell Club President John Broderick, The Pups’ Lachlan Vallender, Jack Page, Angus Smith and Logan Croke, Crookwell Rotary Club Secretary Peter Cullen, Crookwell Junior Rugby Union’s John McCue, The Pups’ Emma Page, Crookwell Senior Rugby Club’s Ally Horan, Member for Goulburn Pru Goward, Upper Lachlan Shire Council Mayor Brian McCormack OAM, Barbell Club Vice President Dan Wray, Crookwell Senior Rugby League’s Mitch McGeechan and Council’s Acting General Manager Andrew Croke celebrate. The State Government has kicked off the upgrade of Crookwell Memorial Oval with a $600,000 funding boost under the Sport and Recreation Infrastructure Grants Program. The funding is in addition to $425,113 from Upper Lachlan Shire Council and pledges of $3,000 from the Barbell Club, $2,000 from Crookwell Junior Rugby Club, $2,000 from Crookwell Senior Rugby Club, $2,000 from Crookwell Junior Rugby League, $1,000 from Senior Rugby League, $1,000 from Crookwell Rotary Club and $500 from the Lions Club of Crookwell. 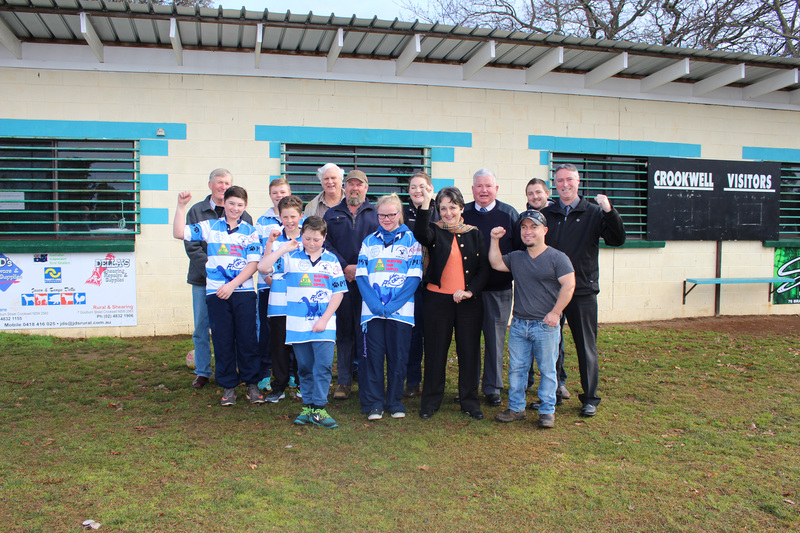 The estimated $1,036,613 upgrade will include the demolition of the existing toilet, gym and canteen block and construction of a new community sports centre with a club room, gym, change rooms, referee room, storage facility, canteen and toilets with disabled facilities. Member for Goulburn Pru Goward said the Sport and Recreation Infrastructure Grants Program supports and promotes healthy lifestyles in communities across NSW through participation in sporting activities. “The Program is an initiative made possible through the NSW Government’s Clubgrants Category 3 Fund, which reinvests profits from gaming machines into community projects,” Ms Goward said. Upper Lachlan Shire Council Mayor Brian McCormack OAM said the project was a wonderful example of what can be achieved when the community works together. “On behalf of Council and the community I’d like to thank the State Government for their funding contribution, which has made the upgrade of the Crookwell Memorial Oval possible,” Cr McCormack said. Construction of the new community and sports centre is expected to take place in the 2018/19 sporting off season, with further community consultation helping to inform the project.